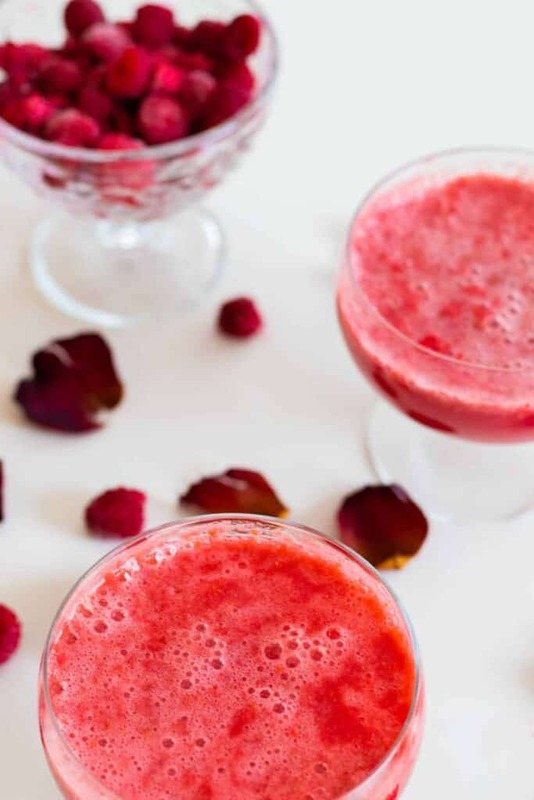 This Valentine’s Day appropriate cocktail has all the flavor but none of the alcohol – full of deep raspberry flavors, a hint of grapefruit and topped of with pink pepper tonic to give it a grown-up taste and a bit of sparkle. So good you won’t even miss the alcohol! If you listened to my episode of BFF with the Chef, you know making mocktails is a new hobby of mine. I have so much fun thinking up all these flavor combos, and as I’m a quite impatient person I really like how quickly you get to your final result. No cooking and baking and waiting and waiting and waiting – just mix some stuff together, taste, and start over if you didn’t like it. And since there’s no alcohol – I can do it on a Tuesday morning, and have as many trial-and-errors as needed without getting drunk or pouring it down the drain. Since I started making more mocktails at home I’m always on the lookout for different flavorings to add to them. You know, we’re going for tasty and grown-up even without the alcohol – which is no simple feat. So when I found Schweppes Pink Pepper Tonic at my grocery store I knew I had to try it! And let me just say – YUM! It’s so perfect for making mocktails, because it has a very distinct tang to it. To be honest, I couldn’t really taste the pink pepper, but I did feel like this tonic had an even sharper taste than the regular kind. And hence, works even better for a mocktail! Without the sharp taste of alcohol, I want all the bitter and feisty tonics I can find! Another favorite when going for non-alcoholic yet grown-up in taste is grapefruit. I love grapefruit, in basically everything. Gimme a good grapefruit juice over OJ any day! But for non-alcoholic cocktails it’s truly a lifesaver. I’ve made mocktails with fresh pressed grapefruit juice before – this time I instead went for a grapefruit tonic, which is kinda like a grapefruit soda but a bt lighter on the sugar. I feel like while it has some added sweetness, it also has a more distilled and bitter grapefruit taste – which was exactly what I was after. You could use regular grapefruit soda or grapefruit juice as well – just choose your favorite grapefruit drink and you’ll be all set. 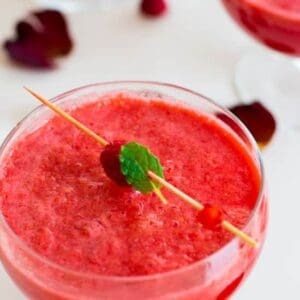 The third component here is a delicious raspberry mixture, and I can already see myself making a non-alcoholic daquiri from this come summer. 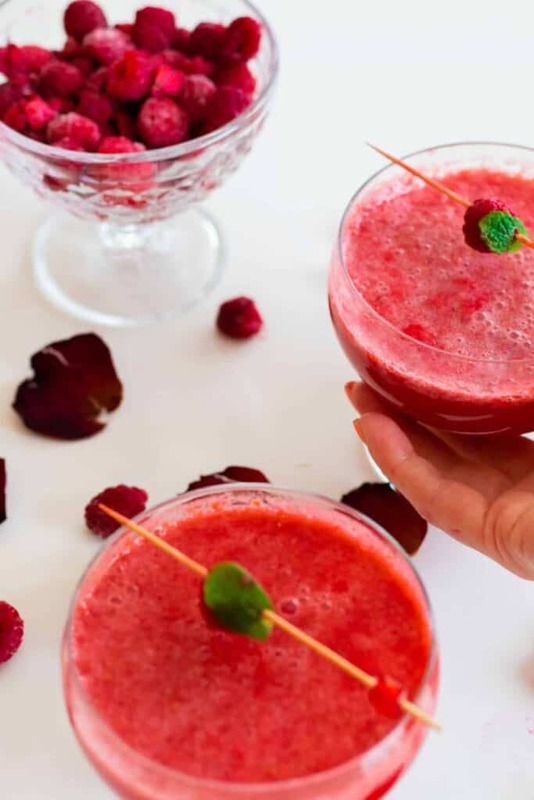 It’s super easy to make – just mix together raspberries, lemon juice, mint leaves and some water – and it gives this drink such a deep and delicious raspberry flavor and the perfect red color. 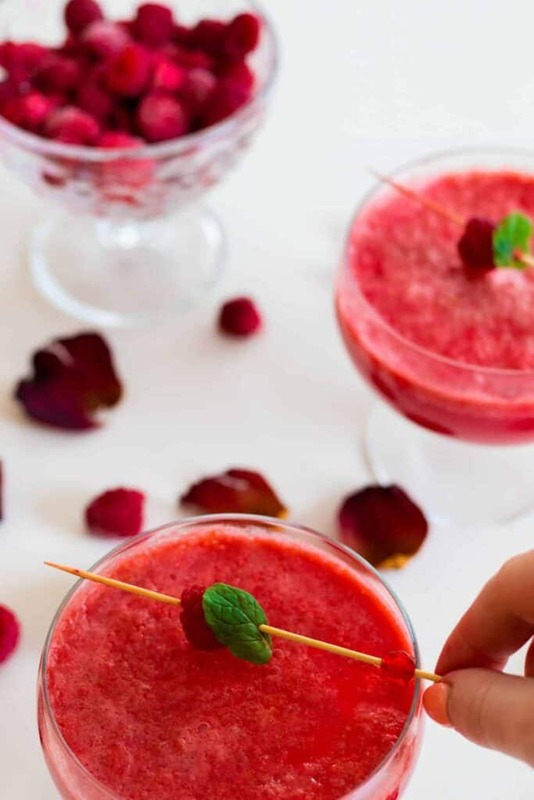 And that’s all there is to this beautiful Valentine’s Day mocktail. What’s your go-to for making your mocktails taste more grown-up? Let me know in the comments below, and that might be my next one to try! 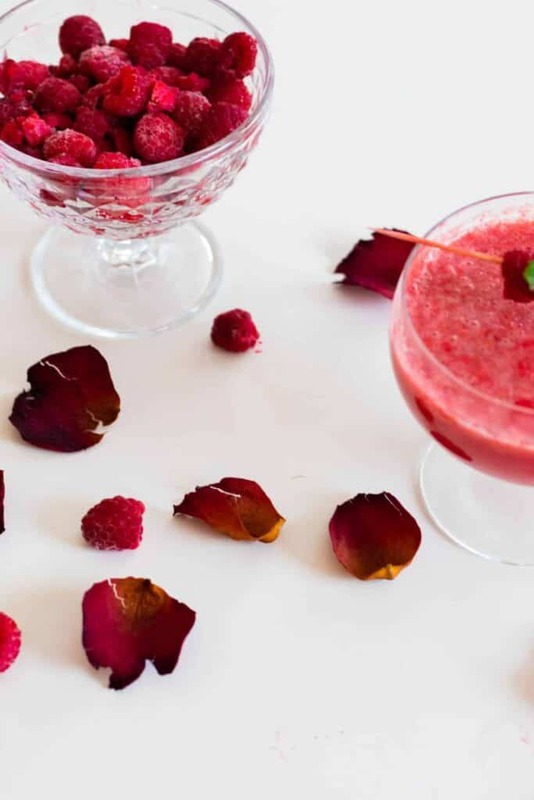 Add the frozen raspberries, lemon juice, mint leaves and water to a blender and blend until smooth. In each glass, add 4 Tbsp of the raspberry mixture and 4 Tbsp of grapefruit tonic. Mix together carefully with a spoon. Fill up the glasses with Schweppes Pink Pepper Tonic and decorate with raspberries and mint leaves on swizzle sticks. Serve immediately! 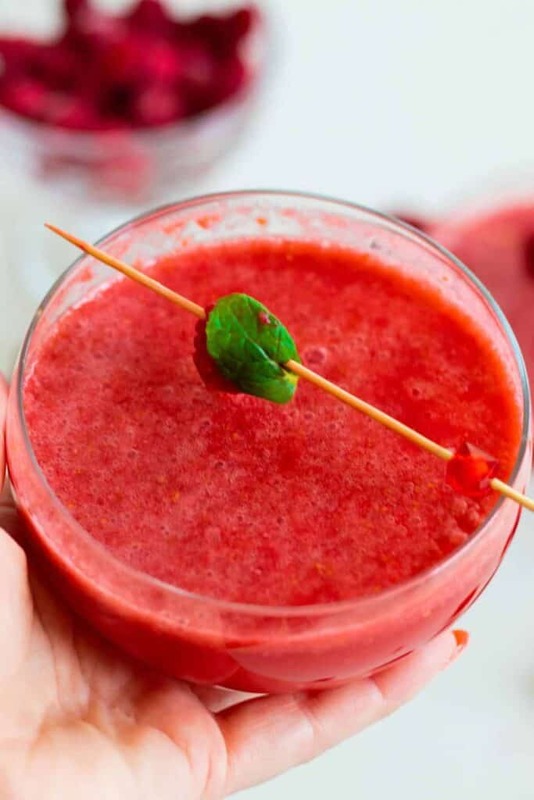 This is such a wonderful drink to celebrate the holiday! I love a good sparkling mocktail! Thank you Sabrina! Hope you try it! 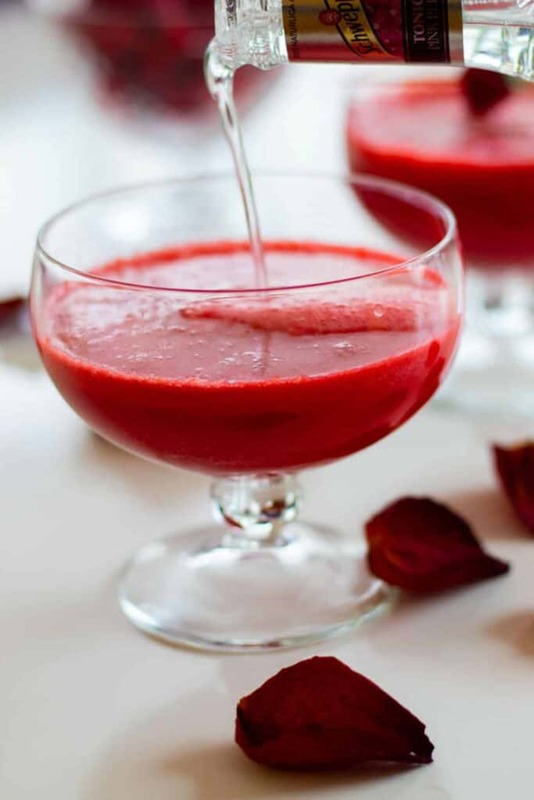 This is the perfect mocktail for Valentines day!!! So yummy! 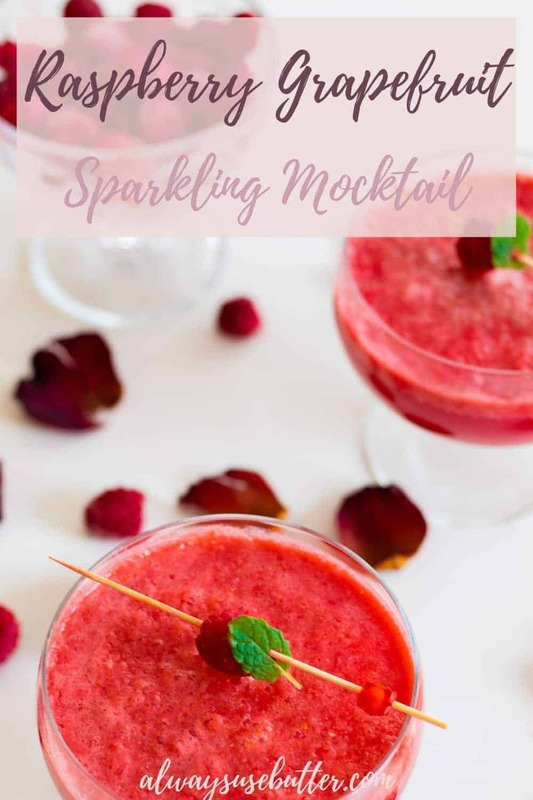 This Sparkling Raspberry Grapefruit Mocktail looks like a great non-alcoholic beverage for Valentine’s day and for summer! For those of us that can’t have grapefruit, what would you recommend as a substitution? Thank you for commenting! I actually tried it without the grapefruit and with just the pink pepper tonic and it was delicious! So just skip it and it will be great as well. 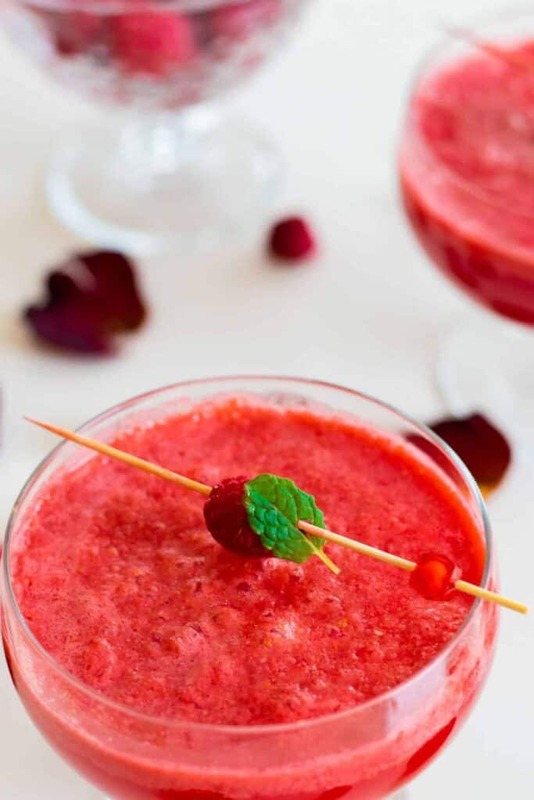 How fun are these sparkling raspberry grapefruit mocktails. I can’t wait to make these refreshing drinks for my girlfriends!!! Well sometimes you have to go the other route 😉 This would probably be delicious with orange as well though, just a lot sweeter!